Tea For Joy: And, relax. I'm just recovering from a very busy week and long working hours. But my week has been filled with excitement! First, my shop was featured on Daily Candy. I am thrilled with the response. It's been great to realise that my favourite items are my customers' too. There's a little interview about me and my business at The Shop Bug - thanks Rachel! My shop is nominated for a Shopify design award - please help me raise my profile and vote for me here. I think you need to be a Twitter-er, but if you vote you can be in with a chance of winning a Macbook Pro and some other Apple goodies. I am lucky enough to work a four-day week, and I've set tomorrow aside to accomplish a lot of non-blog things, so I'm leaving you for the weekend with a picture from Hannah's blog, Hello Mr Fox. I love this photo from her new flat - see more of her lovely little collections here. Oh my gosh! That's amazing about Daily Candy! So cool. voted you:) i hope you win! wow! what a week! i did try to vote for you but you're right it's only open to Twitter users. but good luck, i hope you win! eeeee! congrats on the daily candy, that is awesome!! Saw that you are following Brian Drapper on Twitter, we were at Greenbelt too...Just listening to Miriam Jones Ashes or Gold to start my weekend. Sorry I meant he is following you! congrats on the feature on Daily Candy, how exciting!!! I'll go vote for you now. Congratulations on such amazing features!! Congrats on getting featured on Daily Candy thats huge! Congratulations...your shop looks amazing ;0) I have been out of the blogging sphere for a while. Need to get back into it! Exciting stuff! 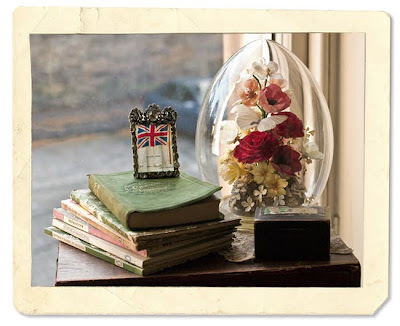 OH that bell jar (cloche) is amazingggggg! Going to have a look at 'Hell Mr Fox' right now.